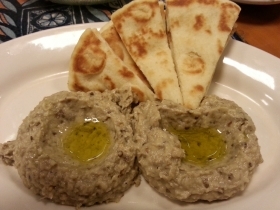 Have you made Baba Ghanoush? Photo Attribute: Sarmale / O. 1. 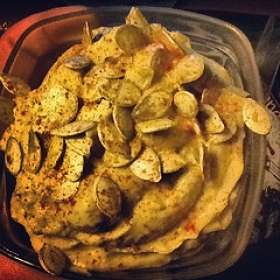 Prick the eggplant all over and bake it at 350 F-400 F until they collapse (They should look like prunes) - an hour or more. 2. When they have cooled, skin them and chop finely, sieving out the large seeds, if preferred. 3. Add the other ingredients, except the tahini, and whisk well with a wire whisk. 4. Stir in the tahini and chill well before using. 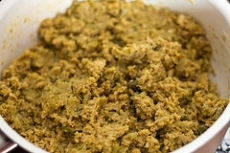 This recipe contains potential food allergens and will effect people with Lemon, Soy, Eggplant, MSG, Sulfites, Sesame Seeds, Garlic, Fructose Malabsorption, Olive Oil allergies.